I was always one of those people who thought growing blackberries was pointless. The hedgerows are full of them, right? Why devote valuable plot space to something that is readily available a few minutes walk from most people’s houses? What’s more, it seemed at odds with my inner being. That kind of dreamy hunter gatherer that lurks in most men had decided that growing a cultivated variety of the blackberry was somehow at odds with nature. I was a blackberry purist, and wasn’t for budging. Then one day, a good friend bought me a couple of plants as a present. I was grateful, of course, but I couldn’t help thinking I wouldn’t be giving valuable growing space over to them. However, like all growers, I hate seeing lonely plants sat in pots rather than out in the soil, so we found some room on the plot. I justified this to myself by deciding that by training the blackberries up supports, I’d be making a useful windbreak for the more delicate fruits. In went the plants, spaced and trained as recommended by the RHS, and we left them over Winter. Productive, bigger, tastier… and thornless! I was told that cultivated blackberries can be very productive, but come the following year I was still caught by surprise. Not only were there lots of berries on the plant, but they were a really good size, and certainly a lot bigger than the wild alternatives in the local hedgerows. Then I tasted them. They were delicious – sweeter than wild berries, and being that big bigger, an all round more satisfying edible experience. They didn’t crumble in my fingers, and they went a lot further than the wild blackberries. And guess what else? No thorns! I’d been bought a thornless variety, so no more tricky prickly pickings for me. During that Summer I still gathered a few berries from the footpaths around our house when out walking, but I became a cultivated blackberry convertee. In fact, I liked them so much, I bought some more plants. I’d heartily recommend the popular Loch Ness AGM variety, the berries of which grow to a really good size and last well into Autumn. In the second year the plants became very vigorous, and we had to do a little pruning to keep everything in check, as well as dig up the new canes that had been thrown up nearby. Such was my new found blackberry love that we planted these out too. This year has seen the plot blackberries go from strength to strength. I’ve harvested pounds of the things, and used them regularly in cakes and porridge as well as freezing some for Winter. They’re also delicious added to stewed fruit and natural yoghurt. 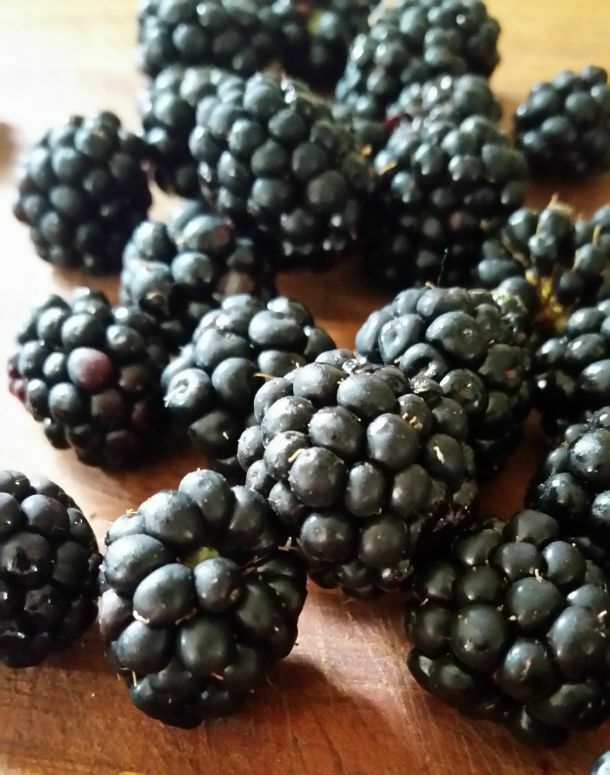 Of course, there is still a magic to be found in foraging, especially when I’m out and about with Lewis, but despite my initial reservations, my blackberry bushes are definitely here to stay. And these days, they’re more than just a windbreak. I whole heartedley agree! In similar circumstances I obtained one “Chester” plant last year and harvested a bucket full of delicious berries. This year I have planted another two (using the windbreak logic) and the berries from the older plants have been even bigger and better. I have bottled some in a syrup made from Port as a Christmas treat. Can’t wait!